Fort Myers, FL – May 18, 2012 – Attorney and Mediator Keith Grossman, founder and Managing Partner of Grossman Law & Conflict Management, was honored to receive the “Patrick Catania Philanthropy Award” by the organizers of the Sabadell United Bank Keymorada Invitation Fly Spin Tournament, an annual signature fundraiser for the Crohn’s and Colitis Foundation of America. The award is given to the person best representing the spirit of the tournament. “I am incredibly honored,” said Grossman, who has been a supporter of the tournament and a fundraiser for the Crohn’s and Colitis Foundation for the past years. The award was created to honor the legacy of Patrick Catania, a “larger than life figure” who was devoted to organizing and supporting the tournament. Catania recently passed away from cancer. 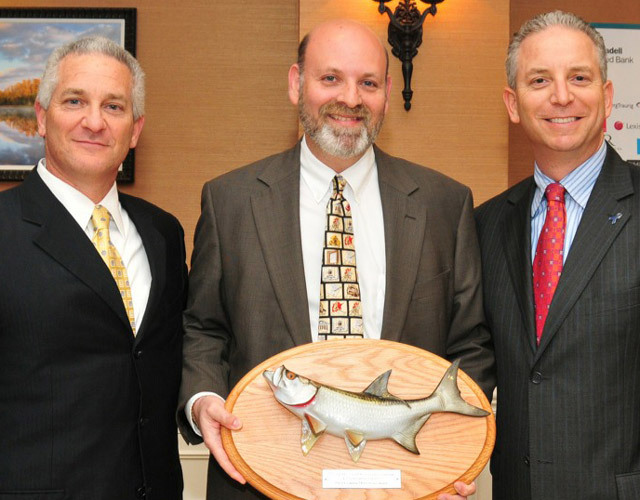 Grossman was presented the award at a tournament kickoff party at Sabadell Bank in Naples on April 17th. The annual tournament will be held May 8-11 in Islamorada in the Florida Keys. As part of the event, law firms from all over the country compete to become the "Keymorada LexisNexis Law Firm Challenge Champion" by making tax deductible cash contributions.